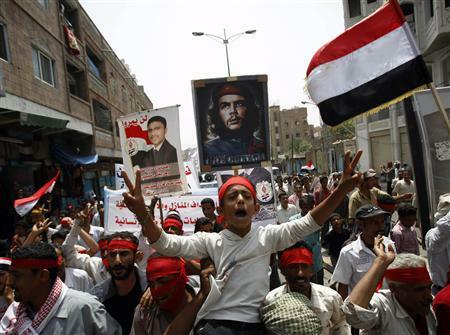 Tens of thousands of anti-regime demonstrators marched through Yemeni streets on Tuesday to condemn what they said were government attacks on protesters the day before. Thousands of demonstrators, including Islamists, held peaceful rallies in Rabat, Casablanca and Tangiers Sunday to demand greater political reforms and social justice in Morocco. Syrian troops and militiamen loyal to President Bashar al-Assad killed 16 people in attacks in the city of Homs on Tuesday, residents said, an escalation of a crackdown against a focal point for pro-democracy protests. The Israeli navy intercepted a French boat carrying pro-Palestinian activists as the vessel attempted to breach Israel’s naval blockade of the Gaza Strip on Tuesday. Thousands took to the streets of Bissau Tuesday for the second rally in five days to demand the resignation of Prime Minister Carlos Gomes Junior, accused of hindering an assassination probe. More than 3,000 democracy supporters led by Aung San Suu Kyi marched Tuesday in Myanmar’s biggest city in honor of her father, the nation’s independence hero. The short march was the biggest public demonstration since 2007, when the military junta launched a bloody crackdown on pro-democracy protesters. Over the weekend, residents of Southwest Ranches, Florida protested the proposed construction of a privately run immigration detention center. In the Philippines, college students in Manila and Quezon City walked out of their classes on Tuesday to protest what they called the Aquino administration’s neglect of the education sector. Dozens of Romanians protested Tuesday against a Canadian company’s plans to open a gold mine in Transylvania and called on the culture minister to resign over his support to this project. The two-week strike by 120,000 members of the National Union of Metalworkers’ of South Africa (NUMSA) ended over the weekend when union members accepted a three-year contract from the Steel and Engineering Federation of South Africa (SEIFSA), the main metal employers’ federation in South Africa.